There are three key words, used in this bowl. 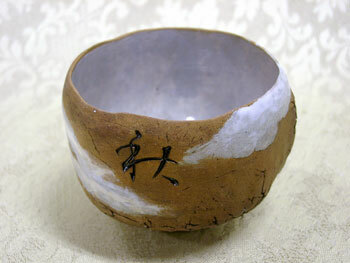 The "old age" character is formed by whimsical cracks on the clay surface. The "autumn" one is engraved and filled with dark, cold-metallic glaze; the character for "mist" flooded with white almost sinks in the streams of fog, curling around the bowl. Some delicate drops of dew located at the bottom part of the thing give an additional impression. This in combination with light grey foggy inner surface of the bowl and the very manner of inscription helps to feel the hidden shades of the Basho's poem.